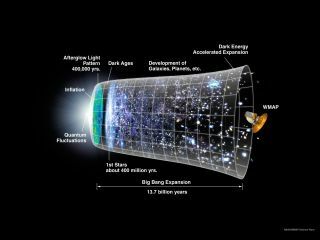 The Big Bang was the beginning of the universe as we knowit, most scientists say. But was it the first beginning, and will it be thelast? A popular picture of the early universe imagines a singleBig Bang, after which space blew up quickly like a giant bubble. But another theoryposits that we live in a universe of 11 dimensions, where all particles areactually made of tiny vibrating strings. This could create a universe stuck in acycle of Big Bangs and Big Crunches, due to repeat on loop. Which scenario is closer to the truth remains to be seen,but scientists say new experiments underway could provide more answers soon. According to the BigBang theory, the universe began extremely hot and extremely dense. Around14 billion years ago, space itself expanded and cooled down, eventuallyallowing atoms to form and clump together to build the stars and galaxies wesee today. On this, most scientists are agreed. "I would say that there is 100 percent consensus,really," University of Pennsylvania particle physicist Burt Ovrut said ofthe Big Bang theory. "There is overwhelming evidence ? all of thepredictions are true." For example, this theory predicted that the universe todaywould be filled with pervasive light left over from the Big Bang. This glow,called the cosmic microwave background radiation, was discovered in 1964,almost 20 years after it was forecast. However, what caused the Big Bang, what happened at thatexact moment, and what came immediately after it, are much more open to debate. A dominant idea that connects the dots between the Big Bangand the universe we find today is called inflation. This is the notion thatduring the first roughly 10 to the minus 34 seconds (0.0000000000000000000000000000000001seconds), the universe underwent exponential expansion, doubling in size atleast 90 times. During this early stage, matter was in a much different statethan it is now. This theory could explain some of the main conundrums posedby the Big Bang: Why does the universe appear mostly flat, with roughly thesame amount of stuff spread smoothly throughout it in all directions? "If you imagine the matter was in that different statein the early universe,the whole story changes," said Andreas Albrecht, a theoretical physicistat the University of California, Davis and one of the initiators of inflation. "Thephysics can create the smoothness for you. Inflation also makes it flat. It allfits beautifully into this story told by inflation." But Albrecht and others admit the theory doesn't yet explainthe whole picture. "Inflation is easily the most popular theory in cosmology,"said theoretical physicist Neil Turok, director of the Perimeter Institute forTheoretical Physics in Ontario, Canada. "It's a good theory, but it hassome weak points. It can't describe the moment of the Big Bang." The Big Bang theory envisions the universe beginning from asingularity ? a mathematical concept of infinite temperature and infinitedensity packed into a single point of space. But scientists don't think this iswhat actually happened. "It wouldn't really be infinite," explainedphysicist Paul Steinhardt, director of the Princeton Center for TheoreticalScience at Princeton University in Princeton, N.J., and another architect ofinflation. "Infinity just means a mathematical breakdown. It's a statementthat you shouldn?t have extrapolated your equations back that far because theyjust blew up in your face." Neither Big Bang theory nor inflationary theory can describewhat happened at that moment. And inflation has other problems, in some people's view. Becauseof quantum fluctuations, different parts of the universe could inflate atdifferent rates, creating "bubble universes" that are much largerthan other regions. Our universe may be just one in a multiverse,where different scales and physical laws reign. "It means everything and anything that can happen,will," Steinhardt told SPACE.com. "So basically everything could be aprediction of inflation. This to me is a fundamental problem and we don?t knowhow to get away from it." Others say that while inflation may not be complete yet,it's still the most useful thing we've got to describe the origin of theuniverse. "Even if all things are possible it could turn out thatsome things are much more possible than others, and you could still have aprediction," Albrecht said. "The real excitement to me is that there'sso much data supporting inflation that it really makes it seem worth thinkingabout these questions." In 2001, Steinhardt and Turok proposed an idea called thecyclic model, based on an earlier concept called the ekpyrotic universe thatthey'd conceived with Ovrut. In this scenario, the universe undergoes an endless sequenceof "bangs" and "crunches" ? i.e. periods of expansionfollowed by periods of contraction. At each transition, the universe would havesome finite temperature and density, rather than the infinity of thesingularity, and the expansion and contraction would be relatively slow, asopposed to the exponentially quick expansion proposed by inflation. The idea is based on M-theory, a version of string theorywhich suggests that every particle is in fact a tiny loop of string whosevibration pattern determines what type of particle it will be. However,M-theory requires the universe to have 11 dimensions. So far, we can onlydetect four dimensions ? three of space and one of time. But maybe the otherseven are hidden, proponents say. Scientists call the four-dimensional part of the universe wecan see a brane, and suggest that other four-dimensional branes may also existinside this 11-dimesnional space. "If you have another brane living in higher dimensions,it's extremely likely to move and slam into our own brane," Ovrut said. "You have a brane with exactly the structure of our real world, and otherbranes that are likely to hit us, and all of the energy of colliding universeswould come into play. Gee, that sounds a heck of a lot like the Big Bang to me." Advocates of the idea say it offers an exciting way ofaddressing the issue of what prompted the Big Bang, and it avoids some of thepitfalls of inflation. "In the cyclic theory you are not only describing thelast bang, but the ones before it," Turok explained. "It?s a biggerpicture, more complete and hopefully more logically consistent." But other researchers say the cyclic model just hasn't comefar enough to offer a real alternative to inflation. "Inflation runs into trouble when you try to make thebig picture work, but I don?t think the cyclic people have really worked thathard to make the big picture work any better," Albrecht said. "Ithink they have their hands full with technical issues." Luckily, scientists may not have to wait too long to learnwhich theory is a better bet. The models make different predictions aboutcertain aspects of the universe that are measurable today. For example, inflation could have created gravitationalwaves ? distortions of space-time caused by gravity ? that should be observable. Some new instruments, like the Plancksatellite which launched in 2009, and an instrument called a polarimeterbeing built at the South Pole Telescope in Antarctica, could measure thesewaves. "If we were to observe those gravitational waves, thatwould kill the cyclic-ekpyrotic-bouncing theories," Steinhardt said. "Itwould be very consistent with the inflation idea." However, not finding the waves wouldn't really blow a deathknell to either theory, since some versions of inflation don't require gravitationalwaves. Either way, it should be exciting, scientists say. "The quality of astronomical data is just shootingup," Albrecht said. "The data will probably be collected in the nextfive to 10 years, and you can just see what happens."